Your use and access of www.conferenceroomav.com (Website) is subject to the below Terms and Conditions. Please do not use the Website for anything that is prohibited, unlawful, or contrary to the Terms and Conditions. Usage of the Website implies acceptance of the terms, conditions, and disclaimers contained in this notice. Please discontinue usage of the Website posthaste if you do not accept these Terms and Conditions. change or remove (temporarily or permanently) the Website or any part of it without notice and you confirm that Conference Room AV shall not be liable to you for any such change or removal. change, remove, or discontinue any product item on this website at any time without notice and you confirm that Conference Room AV shall not be liable for any such change or removal. The Website's contents do not represent advice. Please do not rely upon it when making or refraining from any decision. Intellectual Property Rights for this website and materials on or accessible via it belong to Conference Room AV unless otherwise specified. This website and the materials on or accessible via it and the Intellectual Property Rights therein may not be copied, distributed, published, licensed, used or reproduced in any way. Intellectual Property Rights includes the below: any patent, trade mark, trade name, service mark, service name, design, design right, copyright, database right, moral rights, know how, trade secret and other confidential information, rights in the nature of any of these items in any country, rights in the nature of unfair competition rights and rights to sue for passing off or other similar intellectual or commercial right (in each case whether or not registered or registrable) and registrations of and applications to register any of them. Conference Room AV hereby recognizes and acknowledges the Manufacturer's ownership and title to all their intellectual property related to products listed, including without limitation, trademarks, copyrights and trade secrets of the Manufacturer related to its Products and otherwise and the goodwill attaching thereto. The Website is provided on an "AS IS" basis without any representation or endorsement made and without warranty of any kind whether express or implied, including but not limited to the implied warranties of satisfactory quality, fitness for a particular purpose, compatibility, non-infringement, accuracy, and security. To the degree permitted by law, Conference Room AV is not liable for any indirect or consequential damages which may arise from the usage of the Website. 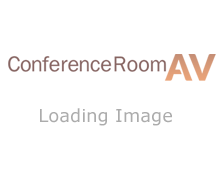 Conference Room AV makes no claims or warranties as to the functionality of the Website regarding uninterrupted service, error free access, defects that will be fixed or corrected or that the Website or its servers are free of viruses or anything else which may be harmful or destructive. The prices listed may have typographical errors and prices are subject to change without notice. Nothing in these Terms and Conditions shall be construed so as to exclude or limit the liability of Conference Room AV for death or personal injury as a result of the negligence of Conference Room AV or that of its employees or agents. Your receipt of an electronic (or any other form of) quotation or order confirmation does not imply our acceptance of the quotation/order, nor our offer to sell. We reserve the right at any time after receipt of order to accept or decline it for any reason. Once order is accepted and subsequently charged (via credit card or purchase order), terms and conditions within apply to said order. We reserve the right to refuse or cancel orders placed for products either listed at the incorrect price or products that are otherwise displaying incorrect information (i.e. typographical errors, incorrect information from our suppliers.) We have the right to refuse or cancel any such orders whether or not the order has been confirmed and your credit card charged. If payment was already accepted and the order is then cancelled, we shall issue credit back in the amount charged. We make every effort to provide accurate colors, descriptions, photos, diagrams, etc for the items listed on our website, however, we rely on information from the various manufactures and are not liable for inaccuracies. If you have any questions or concerns before ordering please contact us. You agree to indemnify and hold Conference Room AV and its employees and agents harmless from and against all liabilities, legal fees, damages, losses, costs and other expenses in relation to any claims or actions brought against Conference Room AV arising out of any breach by you of these Terms and Conditions or other liabilities arising out of your use of this Website. Applicable Law. It is the intention of the parties hereto that this Terms and Agreement and the performance hereunder and all suits and special proceedings hereunder be construed in accordance with and under and pursuant to the laws of the United States of America and that in any action, special proceeding or other proceedings that may be brought arising out of, in connection with or by reason of this Agreement, the law of the State of Idaho shall be applicable and shall govern to the exclusion of the law of any other forum, without regard to the jurisdiction on which any action or special proceeding may be instituted. Entire Agreement. This Agreement constitutes and embodies the entire understanding and agreement of the parties and supersedes and replaces all other or prior understandings, agreements and negotiations between the parties. Conference Room AV reserves the right to add, delete, or modify any provision these Terms of Agreement at any time without notice.